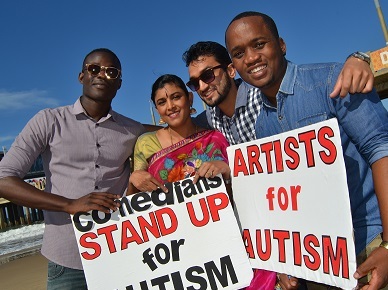 A bunch of local comedians will gather in force as Artists for Autism in a jam-packed comedy night to help raise funds for Action in Autism on October 14 at the George Campbell School Hall . Action in Autism, which provides early intervention for 16 children under the age of 6 at their Centre in Sydenham, will host the Comedy Night with 12 local comedians featuring Analakshmi and Neil Green as the headline acts. Comedians include Troy Tesla, SbuMnyandu, Mo Vawda, Kamz, Mathew, Mfundo, David M, Darryl, Xolani and Vanessa – who all bring their unique blend of humour to the stage for an evening of laughter and fun. Snacks and refreshments will be on sale. All proceeds go to ensuring the continuation of Action in Autism’s services to the autistic community.